We've had good news lately from three organizations willing to help us financially with exhibit development. The most recent is a $5,400 grant from Macy's Inc. to support renovation of the museum's Women in the Military exhibit The exhibit highlights the involvement of women in military service over the past 100 years. Macy's, the department store chain, has a long-standing commitment to give back financially to communities where their customers and employees work and live, nationwide. We were also recently rewarded with a $1,500 grant from the Minnesota Power Foundation to support renovation of the Women in the Military exhibit. The exhibit upgrades should be completed by summer 2015. The Benton Telecommunications Foundation has given a $9,600 grant to support the museum's planned new exhibit about the Vietnam War. The special exhibit, scheduled to open in July 2015, will mark the 50th anniversary of the start of major US combat operations in Vietnam. The service of Minnesota Vietnam veterans will be highlighted through their stories, artifacts, and photographs. Attention will not only be given to combat, but also to the stories of mechanics, cooks, clerks, logisticians, and other support troops from all branches of service. The Benton Telecommunications Foundation was founded by the Benton Cooperative Telephone Company in 2007. Left: Cheryl Scapanski, Benton Telecommunications Foundation Treasurer, presents a check to Jeff Thielen, Executive Director (left) and Doug Bekke, Curator (right). They stand in front of the Vietnam section of the museum's permanent America at War exhibit. Thirty-eight people attended the annual Volunteer and Staff Appreciation Dinner held October 24 at the Camp Ripley Town Hall. The evening got underway with a reception hosted by MHSM Board President Nick Ostapenko, followed by a steak dinner. Then came special awards for services rendered during the past year, drawings for prizes, and finally gift baskets for the ladies and museum caps for the men. As always, "a good time was had by all." Below: Jeff Thielen extends his thanks to the museum's extraordinary crew of volunteers. Some people get hugs. 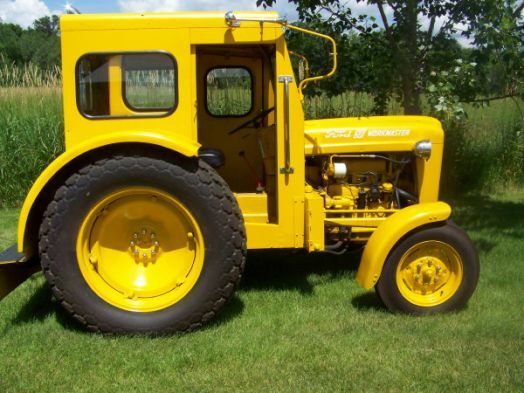 In August we got a bright yellow “Tug,” which is the commonly used name for a 1962 US Air Force Tow Tractor. It was donated by Art Wolch of Little Falls after he retrieved it from a scrap pile in Wyoming. He spent over a year restoring it to original condition. According to Jeff Thielen, it will be a “working artifact” that can be used as needed to move some of our larger objects outdoors. On August 4, for one day only, a mobile museum and memorial housed in a 48-foot trailer was on the museum grounds. The traveling exhibit, sponsored by the Mobile Riverine Force Association, is dedicated to the soldiers of the 9th Infantry Division and sailors of Navy Task Force 117, as well as Navy and Coast Guard units in the Mekong Delta and other areas of Vietnam from 1966-70. In addition, two Minnesota writers who wrote books about Vietnam—Wendel Affield, Bemidji, author of Muddy Jungle Rivers and Ron Mackendanz, Kandiyohi, author of Drafted—were on hand to sell and sign books. About 235 people went through the exhibit that day, which is pretty good attendance for a Monday during the summer. Below: The traveling Riverine exhibit uses a 48 foot trailer. On July 17, the museum hosted the second in a series of History After Hours socials in the historic Little Falls area. About 50 guests enjoyed wine, beer, and hors d’oeuvres while touring the inside and outside museum exhibits. Special “hands on” stations manned by period actor volunteers enabled guests to fire a Civil War musket, pull the bolt back on a WWI machine gun, simulate firing an antiquemortar, taste test a Meal-Ready-to-Eat (MRE), amd assist WW II medics provide first aid to casualties with WW II equipment and supplies. 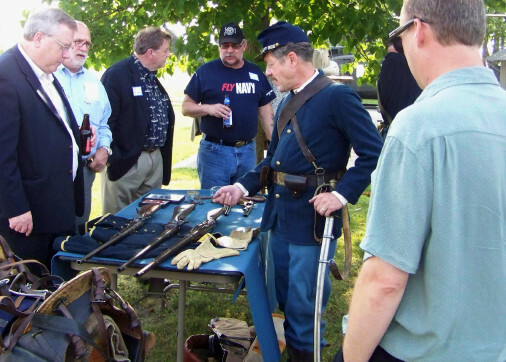 Below: Steve Osman, dressed as a Civil War cavalry soldier, shows History After Hours visitors some of the weapons and accoutrements used by cavalry troops of that era. We're pleased to announce renewal of a "Legacy" grant from the Minnesota Arts and Cultural Heritage Fund, enabling the museum to complete work begun in 2012 with funds from the first grant. The project creates a computerized database to replace the museum's old paper-based record system (we had a 5 x 7 inch card for each item). The project also involves an inventory to ensure that every object in the 50,000 plus artifact collection is matched with a corresponding, accurate digital record. Two half-time Collections Specialists, Katherine Prichard and Peggy Thompson, have been appointed to work on it. Chad Conrady has joined the staff as Archivist for the Military Historical Society of Minnesota and the Minnesota Military Museum. He replaces Lee Smith, who served as our Archivist in a volunteer capacity for 14 years. Chad began work September 9, 2013 following a nationwide search. It is a full-time, paid position—the museum’s first full-time appointment thanks to a special appropriation by the Legislature. Chad worked as Assistant Archivist for the Wisconsin Historical Society for the past three and a half years helping to digitize its archival collections. His volunteer and internship experiences include projects with the Wisconsin Veterans Museum, the University of Wisconsin, and Minnesota's Scott County Historical Society. He has a bachelor’s degree in history from the University of Wisconsin-Eau Claire; a master’s degree in War Studies from the University of Glasgow; and a Certificate of Advanced Studies in Archives and Records Administration from the University of Wisconsin-Milwaukee. He is a member of the Academy of Certified Archivists. As Archivist, Chad will be responsible for collecting, managing, preserving, and keeping a record of the museum’s growing archival collection, which includes paper records, documents, letters, diaries and scrap books, newspapers, pamphlets, maps, posters, photographs, tapes, films, disks, and other relevant print or electronic material of an archival nature that reflect Minnesota’s military history. These materials provide a tangible record of that history and will be used by the Archivist and others to conduct research and support the museum’s broader mission. Creating a comprehensive digital inventory of currently held materials is high on Chad’s priority list. "I really look forward to getting started on all the tasks that need to be done," says Chad, "but I will begin with basic paper records before tackling the photographs and other kinds of material. I expect to implement archival policies that are used throughout the world, such as appraising items for their historical value, and creating electronic finding aids." 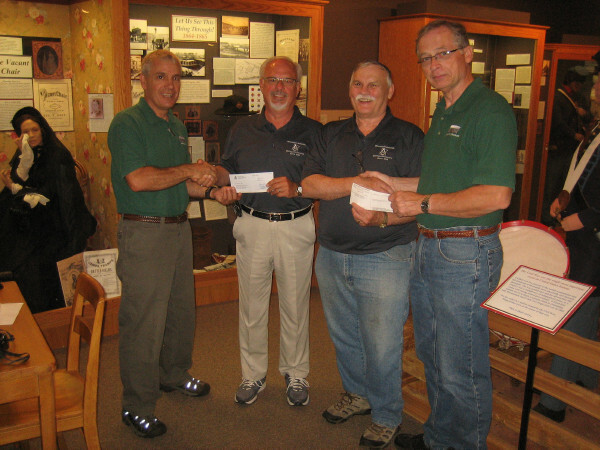 The Grand Lodge of Minnesota and the Minnesota Masonic Charities have come through for the third straight year with matching gifts of $5000.00 each to support the efforts of the Minnesota Military Museum. This $30,000.00 has been used specifically to properly process a huge backlog of incoming artifacts. "Being able to count on this annual gift assists tremendously in our planning and budgeting," stated museum director Jeff Thielen. Presenting the two checks for the Masons are Steven Johnson, Senior Grand Steward and Dave Olson, Grand Master, from the Grand Lodge of Minnesota. Accepting the checks for the Museum are Jeff Thielen, Museum Executive Director and Doug Bekke, Museum Curator. Checks are exchanged. Left to right: Thielen, Johnson, Olson, and Bekke. The heat didn't keep people away on the evening of July 16 for the museum's first-ever Ice Cream Social & Book Sale. Over 250 people turned out for this family event. There were activities for both kids and adults with numerous period re-enactors on hand to help interpret events of military significance. Tanks were available for kids to explore, helicopters were opened for pictures of young pilots, and Civil War re-enactors fired their muskets. In addition the museum held a huge book sale of surplus volumes from the library. Boy Scout Troop 51 grilled brats and hot dogs, and best of all, the Little Falls Dairy Queen served about 180 free root beer floats. 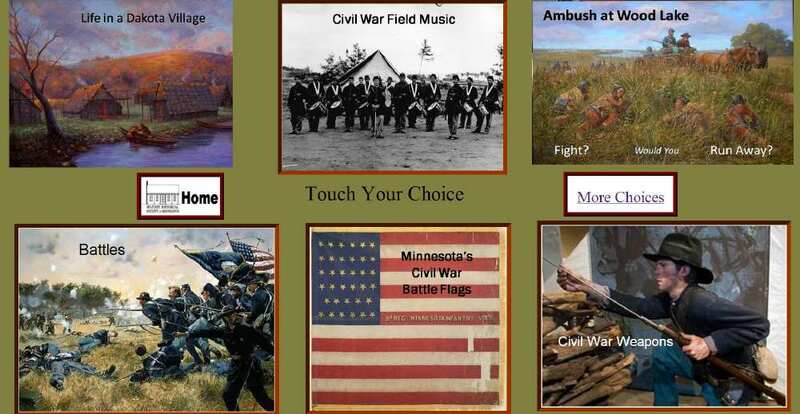 In May 2013, a new touch screen monitor was added to our special exhibit "Minnesota's Two Civil Wars." Designed to encourage students and other visitors to further explore these topics, the touch screen marks the first time we have introduced a computer-based interactive feature to any of our exhibits. Programs include music of the Civil War, animated battles, loading and firing muskets and cannons, and Minnesota’s battle flags. More interactive programs will soon be added. museum's table during History Matters Day at the Capitol on February 18, 2013. An all-time record of 107 tour groups visited the museum in 2012. Schools, youth groups, Scouts, seniors, bus tours, fraternal organizations, and a wide variety of military and veterans organizations discovered the many benefits of group visits. For the past several years, the museum typically hosted about 65 tours a year, so this was a sizeable increase. Jeff Thielen, executive director, attributes the rise to stronger promotion, growing word of mouth, and an improving economy. Want to bring your group for a visit? Click here. One of our volunteer docents, dressed in a period uniform, gives a history lesson to middle school students before visiting the exhibits. At the February 2013 monthly board meeting of the Minnesota Veterans 4 Veterans (V4V) Trust Fund the museum was awarded a $15,000.00 grant. MN V4V is a 501(c)(19) non-profit organization established as the result of the 2006 sale of the Lake Minnetonka Big Island Disabled Veterans Camp to the city of Orono. The grant will fund the first part of a three-year plan to improve Veteran awareness of the museum and to improve their experience once they are here. Planning has already begun for a professionally produced 12 minute “virtual tour” of the museum that will be posted on the website, placed on YouTube, and placed on DVD for distribution to County Veterans Service Officers, VA Medical Facilities and Veterans Organizations. The project will also improve attractions and exhibits that spotlight the contributions of Minnesota’s veterans to our state and nation. They've become an indispensable part of the museum, and they were hailed at our first annual Volunteer Appreciation Dinner, held Nov. 16, 2012, at the Camp Ripley Town Hall. About 35 people attended. The evening began with a reception hosted by board president Nick Ostapenko, followed by a turkey dinner compliments of Jennie-O Turkey. 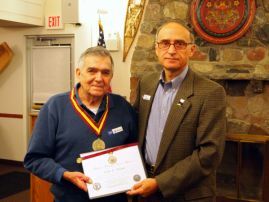 Then came a round of door prizes and a series of presentations of national volunteer service awards to our volunteers. Also recognized was Major General (Ret) Lyle Doerr, who received the Minnesota Civilian Volunteer Service Award, the military's highest civilian award for distinguished community service. General Doerr is a charter member of the Military Historical Society of Minnesota and has been active on the board of directors since the museum's founding in 1976. Museums work every day to educate and inspire the public. We help people to learn, to gain fresh insights and stretch their imaginations, and to interpret information in new ways. It’s at the heart of our mission, but on Saturday, April 28, during our first-ever Volunteer Training Day, 17 of our new volunteers were the ones becoming educated and inspired. The morning’s agenda revolved around why history matters, how to connect with visitors, and ways our volunteers can serve the museum in either the “front of the house” or “behind the scenes.” Following lunch with troops in the Transient Mess, everyone got a full-blown tour of exhibit areas and work/storage areas, and then spent a couple more hours in breakout sessions for those interested in becoming tour guides and docents, doing living history presentations, helping in the gift shop, making dog tags, or working hands-on with artifacts in the collection. It was a jam-packed day, directed by Executive Director, Jeff Thielen, and assisted by Melisa Peterson of the Lindbergh Interpretive Center, Curator Doug Bekke, Docent Craig Johnson, Administrator Sandy Erickson, Museum Assistant Kathy Marty, and other volunteers. Sound interesting? 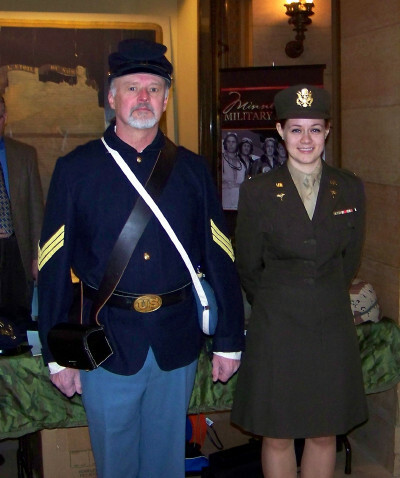 Want to join us in preserving Minnesota’s military history? Click here to learn more. The days are numbered for the museum's outmoded artifact card catalog. Since our founding in 1977, information about each artifact has been recorded on Form 2609, a 5x7 inch card issued by the Army for recording details about each historical artifact. Now, thanks to a $43,400 Minnesota Historical and Cultural Heritage Grant (more popularly known as a "Legacy" grant after the Clean Water, Land and Legacy Amendment to Minnesota's constitution in 2008) we can develop a computerized inventory management system to replace our outmoded card system. 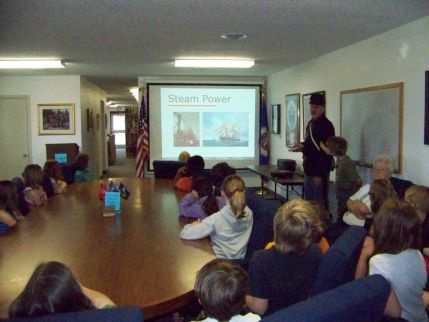 The grant program is administered by the Minnesota Historical Society and is highly competitive. Nonprofit and educational organizations, government units and tribes are eligible to apply for projects in Minnesota of enduring value in the cause of history and historic preservation. Our grant enables us to purchase the necessary software and hardware and to employ a full-time Collections Specialist to tackle the project. After a six-week search, we hired Jeff Bloom, who began work in early March. Jeff has primary responsibility for creating the database, implementing a system for recording information about objects in the collection, training others, and conducting a physical inventory on a portion of the museum's ever-growing collection. The project will be done in phases, with Phase One (the period covered by the grant) expected to take a year. The project will be under the general supervision of Doug Bekke, museum curator, who will be the project manager. The state grant will be supplemented by a combination of $18,930 in cash and in-kind services from the museum's operational budget. "This will be a huge undertaking," says Doug, "but it absolutely has to be done if we are to keep track of what we have. We couldn't put it off any longer." It was a wonderful gift, gratefully received! On Nov. 1, 2012, at the Vet's Service Building in St. Paul, a group of Masons, museum board members, and staff from the Adjutant General's Office gathered on the fifth floor for the special presentation ceremony. Two $5,000 checks were given: one from the Minnesota Grand Lodge and the other from Minnesota Masonic Charities. The money will be used to help the museum record and maintain its growing collection of artifacts. LEFT: David E. Olson, Sr. Grand Warden of the Minnesota Grand Lodge, and RIGHT: Rita S. Glazebrook, Chairwoman of the Board of Directors, Minnesota Masonic Charities, present checks to Board President, Nick Ostapenko. The weather didn't matter. In spite of cool temps and a steady drizzle, the museum was jam-packed. Nearly 2500 visitors walked through our doors during Camp Ripley's semi-annual Open House on Sunday, September 18. The popular family-friendly event paid special tribute this year to Minnesota's Vietnam veterans. On July 9, 2011, over 600 people participated in opening the museum's new Civil War exhibit in a newly added gallery. Entitled "Minnesota's Two Civil Wars: 1861-1866," the exhibit tells the story of Minnesota's involvement in the War Between the States and the U.S.-Dakota War fought within its own borders. Opening day events included speeches, demonstrations and presentations by Civil War reenactors, authentically performed music of the Civil War period, and picnic lunches. This is the most ambitious exhibit ever launched by the museum and will be the largest such exhibit available in Minnesota during the Civil War's Sesquicentennial. Don't miss it! In January and February, 2011, Minnesota Military Museum staff members were involved in the filming of a documentary set in Germany during World War Two. Award-winning documentary film-maker Louise Woehrle (Grandfather’s Birthday, Pride of Lions) contacted curator Doug Bekke and asked if the museum couild suggest locations, provide uniforms, and line up extras that could be used in several historical scenes for her film Stalag Luft III: One Man’s Story. The film is about her uncle, Eighth Air Force Lt. Charles Woehrle, and his two-year plight as a POW at the hands of his German captors. The scenes filmed in central Minnesota recreated a 70-mile forced march during the harsh winter of 1945 when Woehrle and other prisoners were moved from Stalag Luft III to Moosburg, Germany, away from the advancing Russians, in sub-zero temperatures. The museum’s loaner collection, along with Bekke and assistants Doug Thompson and Charlie Pautler, provided uniforms and props. Pautler recruited eight local men to portray prisoners and was himself cast as a German guard. He also scouted locations for the outdoor sequences, most of which were filmed in rural Cushing. The museum’s World War One-era “40 and 8” boxcar was used to “transport” prisoners in one of the scenes. After the filming, Woehrle told museum staff, “we could not have done it without you—words could never express my gratitude for all you did.” The film is expected to be released this summer. The museum was BUSY on Saturday and Sunday, June 4-5, 2011, during the Boy Scout Rendezvous held at Camp Ripley. A total of 3,103 visitors trekked through the museum--mostly Scouts. It was the second largest attendance ever for a single weekend. Jeff Thielen, 57, of Little Falls, replaced Dave Hanson on May 1, 2011, as the new Executive Director for the Military Historical Society of Minnesota and the Minnesota Military Museum. Jeff has a 30-year track record as a successful leader, manager, and supervisor. He retired four years ago as a conservation officer in the enforcement division of the Minnesota Department of Natural Resources. He is also a retired military man, having long served in both NCO and commissioned officer ranks with the Minnesota Army National Guard. An avid outdoorsman, Jeff has been actively involved with numerous non-profits linked to outdoor sports and recreation, including stints on the board of the U.S. Biathlon Association and the Minnesota Nordic Ski Association. He and his wife, Patty, have also been resident volunteers for national parks in Alaska, Hawaii, and Florida. David Hanson, began his third and final career retirement when he stepped down as Executive Director on April 30. Dave gave leadership and oversight to the museum’s steady growth and development for 17 years. Prior to his move to the Little Falls area in the early 1990s, he retired from IBM in Rochester, Minnesota, and also retired as a Colonel with the Minnesota Army National Guard. Dave and wife, Pam, plan to continue splitting their time between Little Falls and Tucson. Welcome Jeff! And thanks, Dave, for your many years of dedicated service.